I sat in the waiting room for three hours while they changed my oil, didn’t bother to rotate my tires because they were so worn out (apparently from not being rotated often enough) and tried to sell me on $1,200 worth of repairs. When I finally asked if my car was done, they were surprised. The car had been done for a while. They called my house and when my wife told them I was sitting in their waiting room, they disagreed with her and said I stepped out. They never checked the waiting room, where I had been sitting for three hours. Apparently they forgot about me and gave up. While paying the bill the sales guy made a big show of walking around the counter to shake my hand. I’ve never wanted to punch somebody so badly. When I left Tires Plus I vowed never to go back. I asked around and decided on the little family-owned service shop that will still pump your gas for you: Pace’s Service Center in West St. Paul. I checked out their website and a friend vouched for them. I went in this morning and sat in one of their three chairs in the “waiting room.” They had no wifi. No TV. No coffee. But they did have a steady stream of customers who seemed to know them by name. A couple people dropped cars off with vague problems and concerns they wanted checked out before they headed out of town. No problem. The guy who drove my car into the service bay was the owner. It was like stepping into a local garage from 50 years ago, complete with an old school “City Gide” map on the wall. An hour later my car was ready and I was impressed. I shook hands with Jim, the service manager, after we chatted about a shared interest in web design. “We want to earn one customer at a time,” Jim said, and I assured him that he had one more. Then I walked out to my car. It seemed clean inside. Too clean. I looked back and the leafy bits from the “tree” Lexi insisted on taking into the car were gone. The window seemed extra clear and the mirrors were real shiny. I got out of the car and went back in. “Did you guys vacuum my car?” I asked. Jim nodded. Vacuuming the interior and washing the windows is standard practice. “You guys rock,” I said, shaking his hand one more time. You can take a guess where I’ll be taking my car from now on. I pulled up at the post office today and saw this. 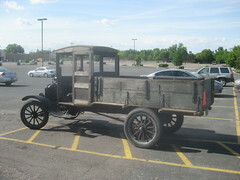 It’s a 1917 Model T Ford. I snapped a bunch of pictures (which seemed eerilie like what my father would do), but I wasn’t the only one. While standing in line at the post office a steady stream of people were going out of their way to check it out, standing around gawking and taking pictures. My favorite was the college-age girl snapping a picture on her cell phone. Stereotypically not who you’d consider to be a car buff, though who knows. The car was quite the attraction, and you can see why. The owner said he had just rebuilt the engine and drove it in a neighborhood parade and car show. Compared to a modern vehicle the thing is ridiculously simple. It’s hard to tell from the picture, but there aren’t a lot of controls (yes, that’s the battery sitting in the middle of the dashboard). It even has a starter crank. I remember in middle school when I learned how an internal combustion engine worked I commented to my dad that it seemed like most of the systems in a car were just complications to deal with issues with the way an engine works (either making things easier, safer or more efficient)—radiator, starter, alternator, transmission, muffler, power steering, brakes, suspension, shocks, etc. You don’t really need all of that (though it sure helps). And this thing is proof. Never mind the creature comforts—seatbelts, airbags, window wipers (heck, windows), climate control, radio, brake lights, a paint job, etc. Though it does have a horn! I didn’t ask the owner if it was a classic ah-ooh-ga sound. I also love the real wood paneling. Even the wheel spokes were made of wood. In the end it’s not much more than an engine. And that’s really just harnassing a controled explosion. Incredibly simple when you get down to it (if you can call controlling an explosion simple). Amazing how far we’ve taken the basic automobile. This video is awesome. A friend of mine has been rocking a mullet for charity. He somehow finagled a test drive in a 2010 Camaro with the designer, Tom Peters. Hilariousness ensues. Read more about the test drive and consider supporting the Camaro drive. That brave mulleted American edited the video for my water walk and helping him score a Camaro for charity is the least I can do. Business Week has an interesting article about Ford’s new marketing czar, Jim Farley. Ford has effectively been having an identity crisis the past few years, struggling to sell cars while it has a reputation for selling trucks and SUVs. The solution so far doesn’t seem especially brilliant, but it’s certainly not bad. Initial ideas include getting dealer input and feedback on marketing campaigns and having strict control over the branding of each model. [Flex product manager Usha] Raghavachari’s brand book instructs dealers and ad makers that the Flex will never be shown with picnicking families, beach volleyball games, or dogs. No mentions of cup holders. “We can’t have this turn into a dog-drool minivan, but it might if we don’t exercise discipline,” says [CEO of Team Detroit, Ford’s ad agency, George] Rogers. All photography of the Flex was shot at night to drive home the nocturnally hip, ready-to-go-clubbing image Ford is aiming for. With gas over $4 per gallon and big oil companies raking in record profits, why are politicians pitching complicated ideas like a windfall profits tax? Wouldn’t it be easier to just repeal the billions of dollars in oil subsidies? I’m not very up on any of this which is why I’m asking the question. But it just seems silly to me that American consumers are whining about paying $4.09 per gallon at the pump, politicians are wringing their hands about gas prices and coming up with silly ideas like a gas tax holiday—yet all the while we’re shoveling billions of dollars worth of subsidies directly into the pockets of oil companies. Con-Way Freight of Ann Arbor, Mich., lowered the top speed of their 8,400 trucks from 65 to 62 mph and they’re saving $13.3 million and only adding 20-30 minutes to their shipments. “I’m saving between $100 and $200 a week by cutting back from 72-73 mph to 60-65 mph,” said Dennis Sheridan, who owns an 18-wheeler and hauls freight on a contract basis throughout the Northeast. Perhaps instead of pitching a gas tax holiday, certain candidates should be encouraging us to slow down. A few years ago gas prices started rising and people started noticing. Back then I was paying $2.69 and griping. Yesterday I paid $3.41. I’m starting to see more and more stories about rising gas prices, but it’s curious that three years ago there was a flurry of gas price hysteria. The prices stayed high but the hysteria faded away. I guess people just got used to paying more. Top 25 Ways to Save at the Pump – My friend Steve Knight offered this list back in 2005, full of practical tips to get more of out your gas. Buy a Super MPG Car – Forget the hybrid, if you really want good gas mileage, you need a Geo. MPR featured this St. Cloud, Minn., mechanic who fixes up old Geos and sells them to people looking for cars with better fuel economy. Many of his cars get 50 mpg or better. Join the Hypermilers – Or you could join the folks who squeeze every last drop of fuel efficiency out of their cars by changing their driving habits and score eye-popping miles-per-gallon. Some of these measures are dangerous, but the basic idea of slowing down, letting your car coast, and avoiding hard accelerating or braking is smart and effective. Hybrid Schmybrid – You could switch to diesel. Or grease. If gas prices still have you down, you can always take the bus. Last week we took a family trip to the Children’s Museum. Lexi had a blast and spent most of her nap telling her stuffed bear everything she did. 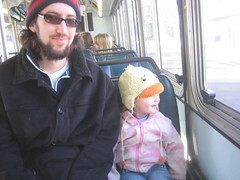 I think one of my highlights was riding the bus (it was also one of Lexi’s highlights). I used to ride the bus to work every day and loved it. I talk about this all the time, but I think public transportation is great. I like to drive, but it’s just as nice to sit back and let someone else do the driving. You get a chance to interact with people and see things you just can’t see when you’re concentrating on the road. It sounds goofy, but I just feel more connected to humanity when I actually interact with them. Even if it’s just a quick nod and smile, it’s more than staring at someone’s bumper. I think Lexi and I will be taking the bus more often.